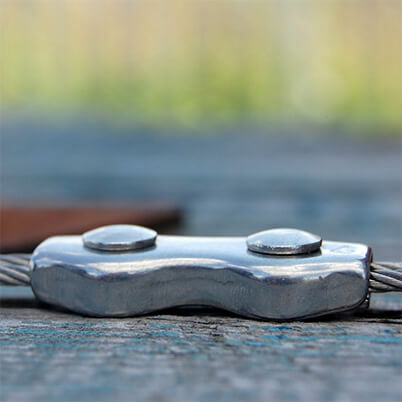 Duplex wire rope grip in marine grade stainless steel is suitable for creating eyes in cable constructions. Tough and hard-wearing for highly corrosive environments. The Duplex wire rope grip can be used particularly with 7x19 construction wire rope which has very flexible characteristics. The approximate failure load is 80% of the cable's breaking load . 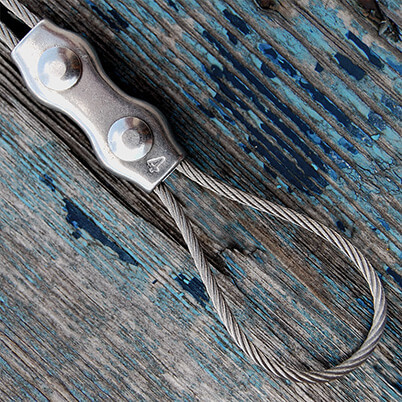 Ideal for 7x19 stainless steel rope, not recommended for use with plastic coated wire rope. For a clean and safe fitting we recommend you prepare the wire rope ends to the manufacturers specification. 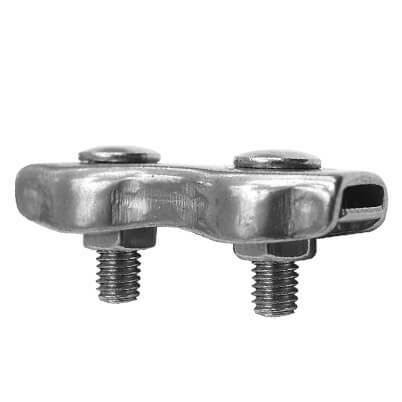 Check you have the correct size clip to match your stainless steel wire rope. Miss-matching could result in serious injury or damage. Pass the wire rope through the clip on one side of the screws threads. Simply loop the wire rope to the required size and pass back through the clip on the opposite side of the screw threads. Holding the wire rope in place - re-place the fixing plate over the screw threads to hold the wire rope securely. 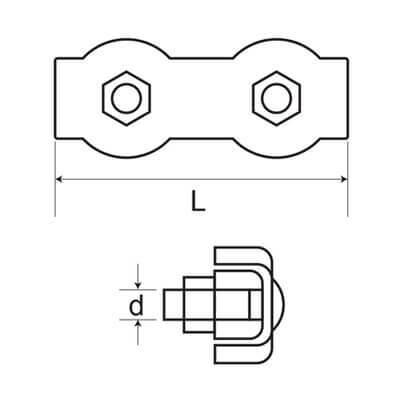 Replace the locking nut bolts using a suitable spanner, making sure you tighten evenly to ensure a solid grip. Once fitted we recommend you test your wire rope assembly to check a secure fixing - please note that this type of loop is not suitable for lifting. Does what itâ€™s supposed to. Quality OK but 4mm 7x19 S/S rope doesnt fit in the 4mm clip. After the catalog of errors it's impossible to leave anything positive. This was just the job for what I had to do with securing the ends of some cables. Excellent product, but the 4mm clip is an uncomfortably tight fit for 4mm wire rope. Next time I'll get 5mm clips. A bit fiddly to get the wire around the bolts & inside the casing. A squeeze with snub nosed pliers helped. Once in, easy to clamp & tighten & should be v secure. Do the job ok but quite hard to get the cable that I purchased in the clip.